Hello there! We've officially made it through the first half of my 31 day series of decorating on a shoestring budget! It's going so fast just like this month. I can't believe Halloween is coming up in in just 2 weeks. I also can't believe that I saw a few Christmas commercials on TV this weekend!? (I don't watch much TV either!) Seriously, we're 2 weeks away from Halloween and Target and Kmart have both started running their Christmas ads!! Are they for real?!? They have no shame! 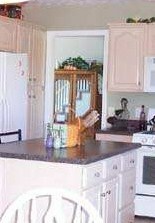 Is your kitchen looking a little out of style but you can't spend a lot to fix it up? 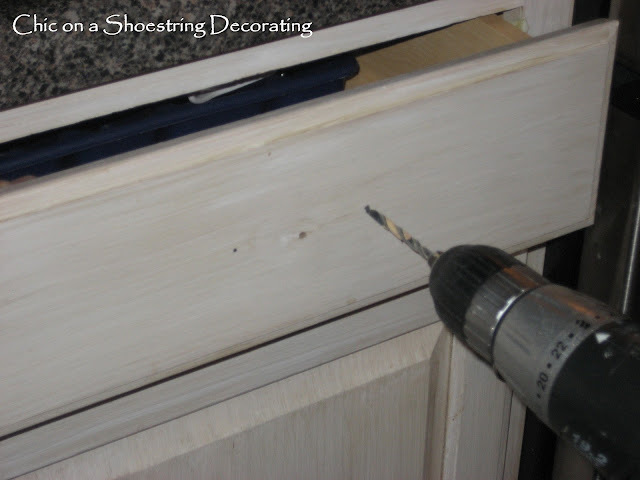 One inexpensive change you can make that can have a pretty big impact it is to change your cabinet handles and/or knobs. People seem to forget about this little detail that can really make such a difference for not a whole lot of cash. We made the change a few months back and I'm so happy with the results. Our cabinet pulls weren't out of style, they were completely fine, just a little boring... plain stainless steel knobs on everything. I decided to put a more stylish cup pull on the drawers. It would make a big difference for a small price. Since I could easily match stainless steel knobs to new stainless steel cup pulls, I only had to buy new cup pulls for the drawers leaving the cabinet doors as is. Consider doing this if your current hardware isn't too shabby. This cut the cost by more that half because we have more cabinet doors than drawers. I got mine from a wholesaler I work with but you can find some decent pulls at Target and even Wal-Mart. I enlisted my favorite handy man Mr. Chic to do the labor for me because he's faster with the drill. But really, this one is easy enough that someone who is a power tool rookie could handle it. Here's a little picture of all the tools you need (which aren't very many). We didn't end up using the grips, we thought we'd have to use them to hold on our measuring tool but it ended up fitting over the top of the drawer. First, remove the old knobs (Duh). Use the smallest screwdriver you've got, the screw head will be inside the drawer. Having a short little screwdriver helps avoid taking everything out of the drawer to get to the screw. Once you've got the old knob off it's time to mark the drill holes for the new pulls. Mr. 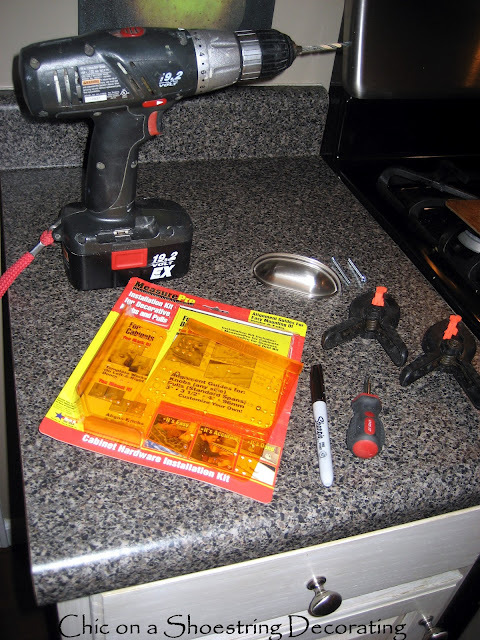 Chic found this handy-dandy and inexpensive "Measure Pro Cabinet Hardware Installation Kit" at Menards and it made this job foolproof! Since the center of the drawer was already marked by the old cabinet knob it was really easy to find, the new pulls had a 3 inch span so we found it on our measuring tool and made the marks for the new holes. Make sure you check your new pull measurement before you drill! This little Measure Pro thing-ma-jig makes sure that your new holes will be placed properly. It takes all of the guess work out of it, highly recommended! And no, they did not sponsor this post! Now that you've got your new holes marked, it's time to drill! This will make some major saw dust in your drawers so you may want to take everything out, especially if the drawer has any eating utensils in it. It's a good excuse to give your drawers a good wipe down. Once I got into mine, the were really kind of grosser than I expected... lots and lots of crumbs! Now that the holes are drilled and the drawers are wiped out it's time to add your new cup pulls! Simply stick the new screws through the new holes and screw them by hand into the handle, make sure you tighten them up with a screwdriver once they are attached. This shot is from the previous owners before we moved in! I'm so happy with the results, what a difference! Could your kitchen use some new cabinet handles or knobs? It might make a bigger difference than you think! Love your drawer pulls, they are fab!!! It looks great! I love your little measurement thing too. Those look fab! 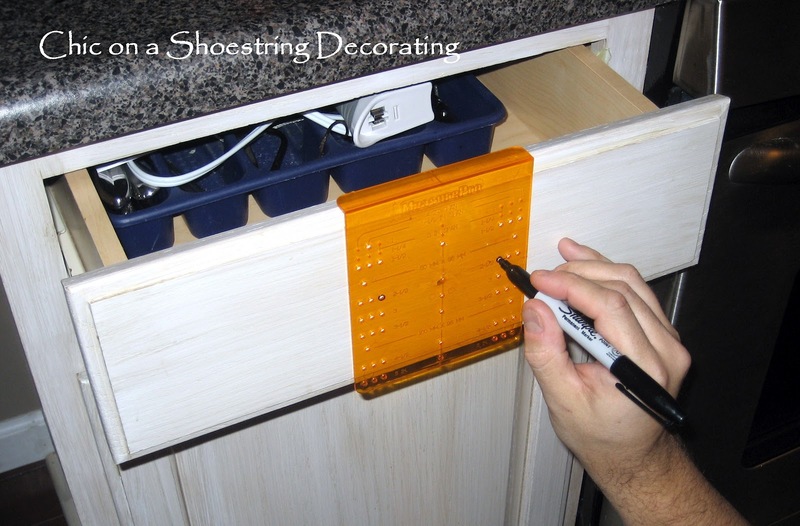 Our cabinets currently don't have any knobs, so this is on my to do list! I think I could handle this project! Kind of liked the real estate before as a frame of reference. Makes me see all the neat projects you've done have really pulled the chic look together! Oh inspiration!! !